Demand for forklifts, other industrial trucks, and associated services exists in every state throughout the US. While data on units produced, sold, and imported is readily available, an analysis of the economic contribution that industrial truck manufacturing makes to the US economy and individual states has not previously been undertaken. 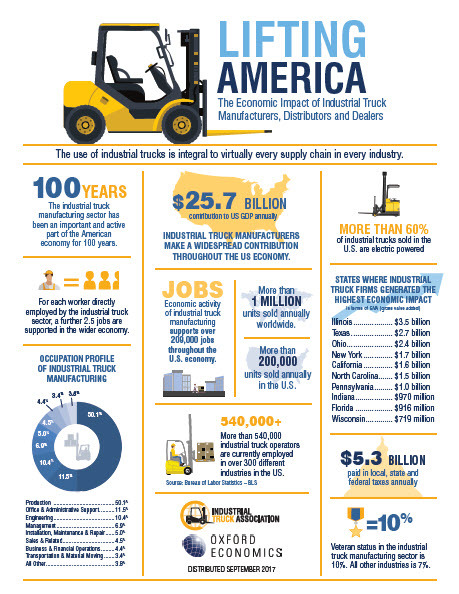 To address this, the Industrial Truck Association commissioned Oxford Economics to conduct research, analysis, and impact modeling to clearly quantify the economic contribution of industrial truck manufacturing and its support services in the US. This report highlights the importance of the industry to the US economy in terms of jobs, wages, tax revenue, and GDP. The report from the Industrial Truck Association (ITA) and Oxford Economics offers detailed data at national and state levels. Click here to view the full report.